After various teases about Mutant Mudds Deluxe undergoing testing by Nintendo for its Wii U eShop release, Renegade Kid's Jools Watsham has now taken to Twitter to give the word on the title's confirmed release date for North America — it arrives on 13th June. This is the expanded HD re-release of popular 3DS eShop title Mutant Mudds, of course, and feature all of that title's content as well as 20 brand-new "Ghost" levels to shake up the formula; those new levels will also be accompanied by a new gun power-up. That's great news for North America, but Europe will need to wait a little longer; Jools Watsham did tell us recently that the studio is working on the European release now that the NA equivalent has jumped through its various hoops. While we wait, you can see some of the new content in action in the all-new trailer, below. WOOHOO!!!! Finally!!! This is great news!!! Then the New Luigi U levels a week later!!! Awesome! I have really been looking looking forward to this! I didn't expect it would come so soon, but I can't complain Take my money! Hey Jools, when is Mutant Mudds 2 coming out for the 3DS? Hm.. as much as I like Mutand Mudds, there's a lot of stuff coming out for me the following months and I'm not sure if 20 new levels are worth repurchasing it. Also, the layer-mechanic worked beautifully with the 3DS, so I'm a little worried if the lack of 3D will be confusing. So this is a re release of the first one but in HD and more content? If its $8 or less, i will probably end up picking it up at some point, but with all the VC games and upcoming Wii U summer/fall lineup, my gaming budget is starting to max out for this year. I've put aside cash for AC, Pikmin 3, Pokemon Y, Super Mario U and a couple other games i'll decide on after E3. Not a whole lot of wiggle room for a rerelease of an old 3DS eshop title, even if it is a great one. I'm sure i'll download it eventually, but it may not be til early 2014. I'd rather buy the new levels for my 100 % completed (DLC completed too) 3DS version. I'll buy MM2 when that comes. EDIT: Arrrrgh! Can't resist! 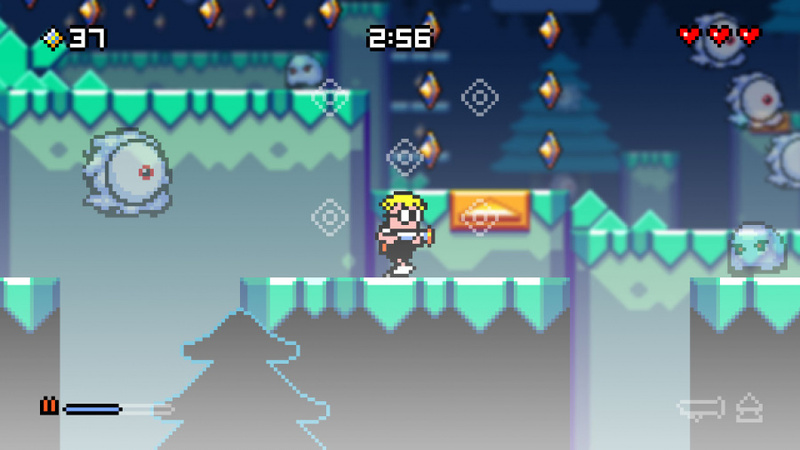 Must... have... more... Mutant Mudds! I'm going to bet on March 2014 for Europe or something stupid like that. Am I the only one who despised the original game? I felt like I was never progressing at all. The character never improved over time (except for shop items which were just extensions, nothing new in any way), so it got stale and boring by about level 3. Also, each level was practically a waste if you didn't get all 100 medals, and the lack of any sort of health restore item in game made each level brutal to complete. I know I'm gonna get a lot of flak for this, but I just really hate this game. Been waiting for this game for a while and it comes out on my 21st birthday ^_^ Looks like I'll have a worthy game to drink too. I remember saying that I thought the original Mutant Mudds looked quite amateur but the basic look has come on quite a bit since the first 3DS version I saw and I kinda like it now. The bigger view area and new depth of field effect in the Wii U version has really helped the overall look of this game imo. I still think the main character's design and animations could do with a wee bit more work though. I also originally said it wasn't going to sell very well but I assume I'm wrong about that because it seems to be doing quite well in both sales, I would think, and indeed critical acclaim. The new depth of field effect in the Wii U version and bigger view area really seems to help with that on a non-3D screen from what I can see.